I am a fan of Michael Yon's work on the current crackdown in Bangkok. Due to his enormous experience as a combat journalist who watched soldiers and police very closely in numerous war zones , he now has his own analogy as he watches the Thai army and police. Quoted from his facebook status he said "When I am in wars, I watch the soldiers and police very closely. I have watched American, British, Iraqis, Afghans, Nepalis and many others. Now I watch the Thai Army and police. When I am in Thailand or India, I also like to watch elephants. People who drive elephants in India are called “mahout” and in Thailand “...kwan chang.” The elephants and kwan chang remind me of the government and the people. The government is the kwan chang. The kwan chang is not really in charge. There is only an illusion that the kwan chang is in charge. All Thai people know what happens when the chang changes his mind. The chang is always in control and this is why I always watch the kwan chang (government) to see how it treats the elephant." A few hours after, he posted on FB that he got this cartoon sent to his email which I thought "pretty much" portrayed Michael's analogy and a clever one indeed, don't you think so? excellent, who did the illustration? This is such a cute illustration ka. More, I like the idea behind this. Couldn't agree more. Didn't Michael ment it the other way? He wrote the govt ist the kwan chang, so the chang must be the people. "...I always watch the kwan chang (government) to see how it treats the elephant." I don't like the Red shirts that much (how can you as a forreigner), but it's fact the the kwan chang (govt) has pissed on the chang, not the reds. You're assuming that the Red Shirts represent all of the people. 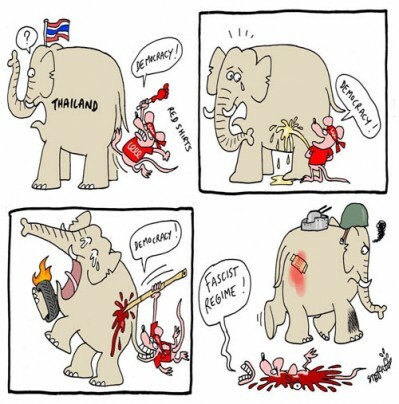 To me, the comic shows the Red Shirts hurting the Thai people and the soldiers protecting the people. like I wrote it sounds indeed like I assume this. Okay, let's better say that the reds are also part of the Thai people (chang) while they are not part of Thai govt (Kwan chang). I pray for Thai people that peace will come back soon. Nobody's right when everybody's wrong. Instead of the mouse saying "democracy" it actually should have been saying "socialism" or, even better "money."